[NEW!!] Question About Over-discharged LiPo--How do I quantify the amount of damage done to the battery pack? eRCaGuy_ButtonReader Library for Arduino - Debounce and read the current button or switch state, & most recent action ("just pressed" or "just released") easily! The Power of Arduino <-- be sure to check out the various really useful Arduino-related links at the bottom of this post! They have helped me a ton. Though I first posted this article on my Instructables page, I decided to update it and repost it on my main website here in order to keep my articles more consolidated and easily maintained by myself. From this point on, I will keep the most up-to-date version of this article right here, instead of on my Instructables page, so if you want the latest info, read here. Don't forget to subscribe to receive an email whenever I post something new by clicking the subscribe link at the top-right of this page! I will never use your email addresses for spam. 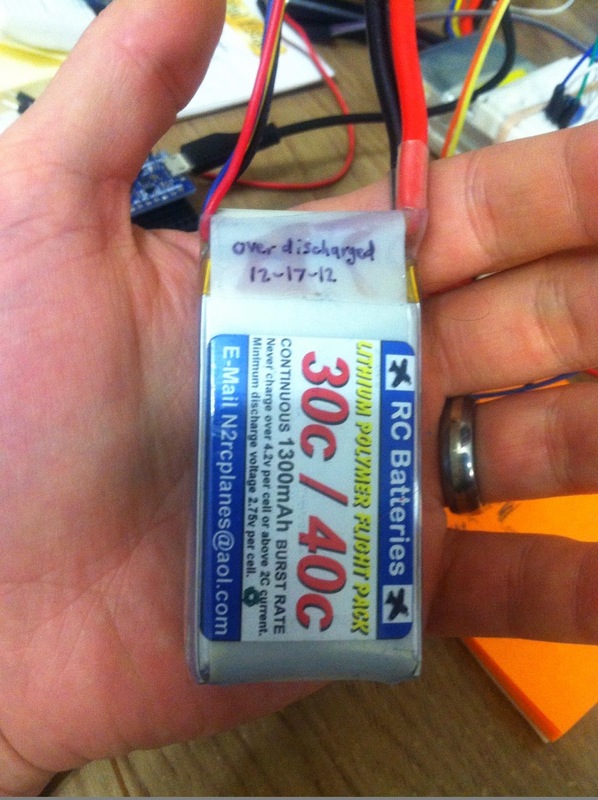 LiPo batteries should never be discharged below 3.0V/cell, or they may be permanently damaged. Many chargers don't even allow you to charge a LiPo battery that is below 2.5V/cell. So, if you accidentally run your plane/car too long, you don't have your low voltage cutoff set properly in the ESC (Electronic Speed Controller), or you leave the power switch on, forget to unplug the LiPo, get your plane stuck overnight in a tree (the same tree, three separate times, for foolishly flying in areas too small because you are too excited to fly and it's almost dark), etc. etc., you may find yourself in a situation where you've discharged your LiPo down well below 3.0V/cell. What do you do? Many people toss the LiPos in the trash. I don't. I restore them. Here's how. -20180526: Added Velleman desoldering review & link. 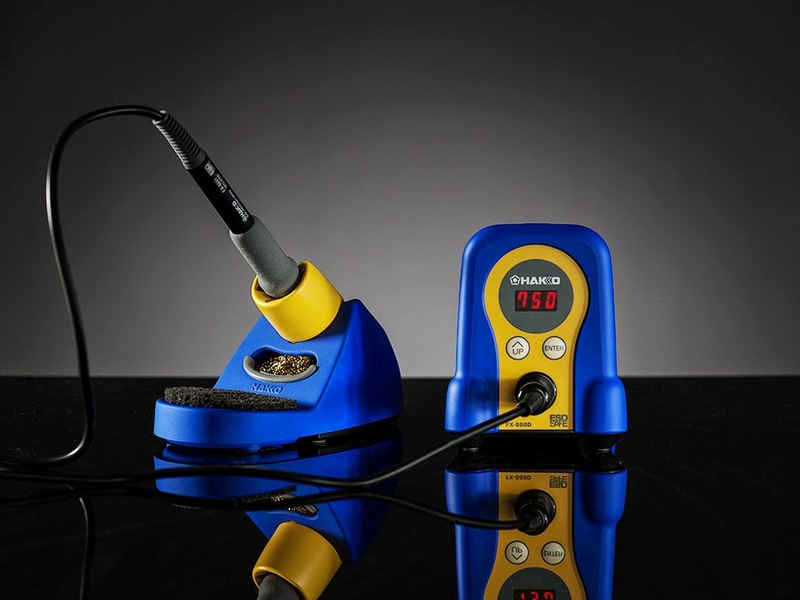 -20161126: updated many links, incl the broken ones from Radio Shack; also added several new sections, including bonus soldering irons, rosin flux, high-power irons & torches, acid-core solders & acid fluxes, & how to tin a soldering iron tip. -20140905: added more soldering iron links, & solder tip tinner/cleaner link, as well as quite a bit more info. Arduino micros() function with 0.5us precision - using my Timer2_Counter "Library"
Here is a list I put together to help people get into soldering & electronics. Keep reading below for more info. eRCaGuy_ButtonReader Library for Arduino - Debounce and read the current button state, & most recent action ("just pressed" or "just released") easily! 20141031: major bug fix; added multi-button support with a new 5-button-reader example! I wanted a simple and universal, yet very powerful & reliable library to read a button or switch in such a way that I can easily implement toggled actions and momentary actions, know the true, debounced state of a button or switch at any given time, and specify whether I want an action to take place when the button is *pressed* or *released. * This library makes implementing all of these things easy for me, and I now use it on all of my projects that require reading a button or switch, so I wanted to share it with others. Hopefully you find it useful too. Check out the included examples. This code is an elaboration of, and library form of, the main Arduino-sponsored "Debounce" example found here. Thanks to David A. Mellis, Limor Fried (LadyAda), and Mike Walters for writing that excellent and well-thought-out example code. (Optionally) donate, & download via the link just above, or by clicking here then choosing the appropriate download. Install the library into the Arduino IDE (using Sketch --> Include Library --> Add .ZIP Library), then run the examples to see how to use the library. -16 Sept 2015 - changed title from "10-bit to 21-bit ADC..." to "10-bit to 16+-bit ADC..."
Using the Arduino Uno’s built-in 10-bit to 16+-bit ADC (Analog to Digital Converter)??? --Wait, what did you say!? I thought that Arduinos only had a 10-bit ADC! How can you get, for example, 16-bit resolution out of a 10-bit ADC? Well, the answer is oversampling. Atmel has written a really good article about it called "AVR121 Enhancing ADC resolution by oversampling." Before I continue, I'd like to give a special thanks to user "fat16lib," on the Adafruit Forums, who first made this technique known unto me by his post right here, thereby inspiring me to write this, my first ever, library. Since posting my initial "Propeller Static & Dynamic Thrust Calculation" post, I have had many questions about where this equation comes from, and several requests to explain more. I have even had college students ask me about the equation. Additionally, this is my most popular post at the moment and is getting over 700 views per month, with the bulk of those hits being from Google Search results about propeller thrust. So, I think it's time I explain more about the background of the equation. Here goes. Aim high! Shoot for the stars and you’ll land on the moon; shoot for the moon and you’ll land on the roof; shoot for the roof and you’ll land in the dumpster. Aim high! I've heard quotes similar to this, and the other day (22 March 2014) I thought about this and wrote it on the top of a to-do list I had which pertains to Unmanned Aerial Systems-related projects I'm working on. These are the types of things I try to remind myself regularly. Aim high. "It should be the end goal of any professional to reach such a high level of skill at what you do that you are no longer limited by your abilities; but rather, you are limited only by your imagination." I was inspired with this thought tonight while listening to this song (Fear Not This Night (ft. Asja)), followed by this song (David Guetta - Titanium ft. Sia). As the second song finished, I thought to myself, “did you hear any flaw in her voice?...are there any notes she cannot reach?...does she not have a perfect mastery of music?” And then it hit me, musical artists at this level are not limited by their skillset, or the lack thereof; they are not limited by vocal control, or a sparse understanding of music, beat, rhythm, and notes. Rather, singers like this are so skilled that they are limited, in what they will accomplish in their music, only by their imagination. So it must be with engineers. In the world of engineers, hobbyists, users and creators of electronics, RC pilots, systems and electronics integration experts and inventors, mathematicians, we must become so adept in our fields that the only limiting factor in what we can create in our areas of expertise is our imaginations. Let us resolve to better learn our fields, and to make personal efforts to improve our skills on a daily basis, so that we can become doers and not just hearers in whatever we do. "Be a Thinker, and Be a Doer," that is what drives me . In regards to my professional interests, my goal is to become so skilled in Unmanned Aerial Systems, electronics, aviation, and computer programming, that nothing can hold me back from developing whatever I want to on the leading edge of technology, stretching the bounds of our world as we know it today. - "Be a thinker, and be a doer" is a quote from Destin, on his "Smarter Every Day" series on YouTube. 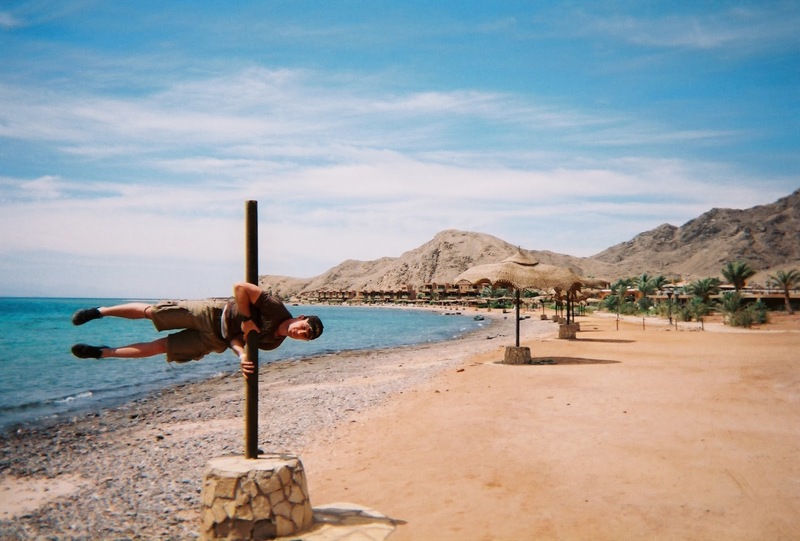 --photo is a picture of me in Egypt, by the Red Sea, in June 2009, on a trip to study Arabic. The Power of Arduino - what is Arduino, and what can it do? Whether you are a beginner, intermediate, or expert Arduino user/programmer, I can almost guarantee you'll learn something new in this article. Be sure to check out the links at the very end! The "Staples Stingray" Glider Sneak Peak! - fly this bungee-launched free flight glider up to 250 ft. high and 1/5 of a mile far in a single flight! Beginner RC Airplane Setup - get a great, economical setup to enter the fascinating world of radio control aircraft! Arduino PPM Reader Code - to read the signal coming out of the back of an RC transmitter! "I wrote a libary to get 0.5us precision on a "micros()" replacement function, so that I can get repeatable results reading a PWM or PPM signal, to within 1us. I searched all around the internet and could not find something comparable (or that was easy to use, and maintained the Arduino's ability to write PWM signals via the Servo Libary), so I think this is my first real contribution to the world of Arduino and Radio Control." External, regulated 5V power going straight into the "5V" and "GND" pins; this can come from another Arduino's 5V and GND pins even! Please support my work and contributions by purchasing an Arduino-compatible Nano from me here. Also, don't forget to like, share, and subscribe at the right. I have just opened up a tiny web-shop in order to make a little extra money to support my work. I intend on purchasing extra parts and pieces when I engage in Arduino or electronics-related products, so that I can sell them on my site. Please support my work, research, blog, and contributions to the world of Radio Control and Arduino microcontroller programming by purchasing my products. You can access my web store by clicking here. I am currently selling brand new Arduino-compatible Nano V3.0's, with breadboard, USB cable, and FREE shipping from and to the United States. 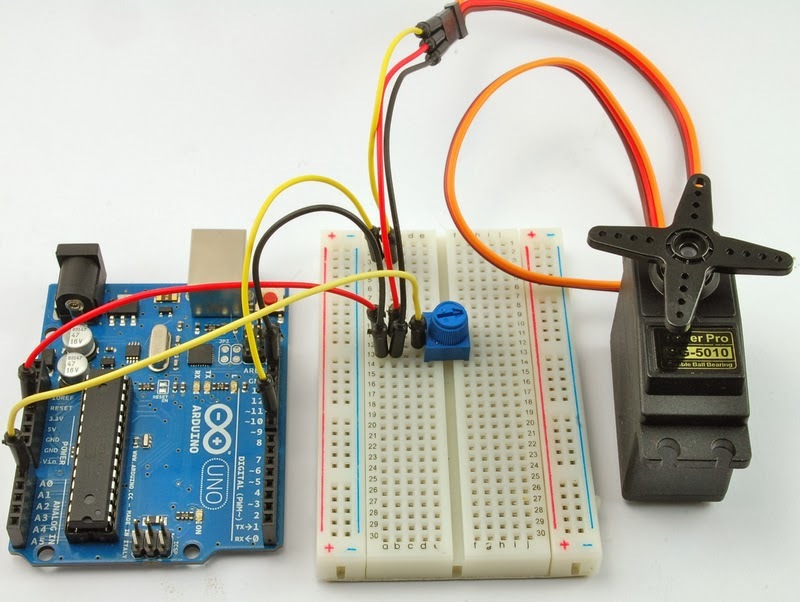 Be sure to check out the links and resources at the end of this article, as they are EXTREMELY useful to anyone who uses Arduino microcontroller development boards! So, you may be wondering why I haven't written an article in the last few months. To be honest, writing a well-informed article, with plots, pictures, and sources takes vast amounts of time, and life gets busy. However, I should also tell you that I have been heavily involved in Arduino microcontroller programming for the last several months, and I have spent countless hours learning about and programming Arduino. I have now built up a variety of Arduino tools and resources that I use, including dozens of bits of test code, many projects and programs, and hundreds of files, links, and resources. I have even written some code and functions which I have seen nowhere else, which I think are very valuable, and which I intend to periodically share here on my blog. In other words, I think I have some useful things to contribute to the vast world of Arduino, some of which will help bridge the world between Radio Control, robotics, and Arduino microcontroller programming. Though I am constantly learning, and constantly seeking help from resources and people who know much more than I, I would consider myself a very informed Arduino user with a sound, yet constantly growing, understanding of electricity, electrical engineering, programming, and computer science. Why have I recently been doing Arduino programming instead of doing Radio Control stuff?